The recipe is not found in the Steelworking Textook. It is found in on of the "Metalworking Monthly" Magazines. To be clear, I'm running 41.2. It's unclear(?) if this version will continue to be worked on. I am saying that anything in IWBUMS is not set in stone. TIS could change anything in it before it goes on the public branch. Which is why I don't have Hydrocraft use that branch and use the public branch instead. Since it is more stable. Really? That's a weird place to put it considering the other sheers is in the Steelworking book...That info should've been in your patch notes since I mistakenly thought it was a bug. I'll update my file locally. ORGM Legacy weapons and ammo. I think the issue might be specific to garage/storage units. I'd actually just gotten the chance to retest it myself without any other mods except just hydrocraft alone using the latest PZ release (39.50), can confirm that hydrocraft items refuse to spawn in these locations, and I'm assuming probably similar locations that are storage related... so far everything else seems OK. Things were originally spawning there just fine before .49 so not really sure what changed that broke it. Thank you very much for this great mod. 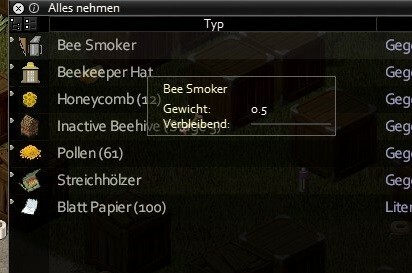 However, I just had a nasty bug where a fully depleted Bee Smoker didn't turn into an Empty Bee Smoker, so now I can't refill it at all! This is a bug with vanilla zomboid code, when anything that can deplete like this (Charcoal, water bottles, concrete bags, bee smokers) are on the ground and they get used for a recipe, this bug will happen. Its something unavoidable currently, so make sure you always keep things like that in your inventory while crafting/using them. Hope this help! A question about the hunting mod. I'm trying to trap beavers, and UngratefulDead wrote they eat the same bait as squirrels and can be found only in the forests. Wiki says squirrels eat corn bait, so I cultivated white corn and tried to trap in the forest. But I can't seem to find any squirrels or beavers at all. Is there an up-to-date list which bait you can use for which animals in which zones? I guess you didn't add HCCornwhite, HCCornblue and HCCornred to the squirrel bait list, am I right? Could you include that in your next update? And one question: If I edit my files locally, the changes will stay like that until the next auto-mod-update (and then will be overwritten with the updated files), right? Hydrocraft v10.1 has been released! - Hunting cannot be done indoors. - Crossbow and Longbow animation fixed! So I was able to build the garden workbench, built some planters and proceeded to pot my plants. After 24 hours in-game time the small potted plants became dry so I watered them. They then reverted back to small potted plants. After another 24 hours they become dry small potted plants again so I watered them again. They then reverted back to small potted plants again. I continued this for 5 days straight! When do they become (normal) potted plants or just ready potted plants? I used corn, cabbage, tomato and carrot seeds. 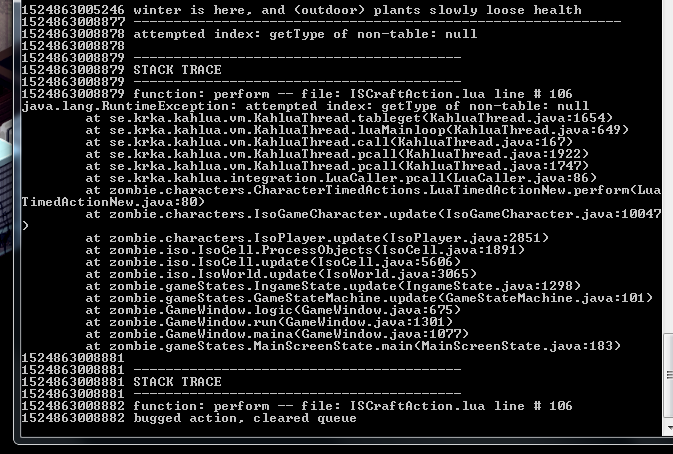 I wonder if this is is some kind of infinite loop where it doesn't know how to change to (normal) potted plants. What are we supposed to do? Water them for a few more days? Looked at wrong code. Removed code reference. I didn't try the planters yet, but the code says (I think) that you have to water each plant a certain number of times until it proceeds to the next stage. I talked to Leliana (the creator of this advanced potted plants system) and it is a server time bug. Small plants are suppose to only be 2 days. "Timed items sometime loop or freeze after server time changes." she says. EDIT: Is this happening for only one type of plant or all potted plants? I tried 4 different plants: Corn, cabbage, tomato and carrot. I'm on SP so I don't know what server time changes means. Any known workarounds? created on the stack or heap. attempt I used 'Rice' instead and one yield was 9 sacks of rice...oops. Was also able to fix 'White corn' yields when you harvest 'Corn' crops. Make sure you test with new potted plants. Nothing from before the last update. This si so we can make sure there is no errors from before. Yes, I removed the plant from the planter and created a new small plant each time. Same results. Is it working for you? Edit: Just created another herbalist table in 10.1 on IWBUMS branch. I had all the components (including the carpenter's workbench) on me and created the herbalist table without any issues. On a totally unrelated topic: herbalist table for sale. Please send inquiries to PPanda0421. I came back to playing this mod after a few months off 6+ months lol. nice to see a total overhaul of the mod and the recipes. now i have to hunt down more things just to make items i used to be able to make just with normal items. good job i am enjoying this mod again and keep up the good work. Yeah if you use steam, un-subscribing and then re-subscribing may help your herbalist table issue. I looted the whole town (Riverside) and only got 2 bags of NPK Fertilizer. In order to build a Gardening Workbench I need 2.5 bags, but in order to make fertilizer I need a Compost Bin that I can only build if I have a Gardening Workbench!?! Okay, I'm trying the potted plants for the first time, and (like other players reported) they won't progress to the next stage. and go back the solar gen looks on but the power is turned off. In the stable branch both vanilla generator and solar gen had this issue. But in the IWBUMS branch only the solar gen has this issue now. Currently the solar gen is useless unless you stay in the current cell. While on the topic, the solar park is still being charged even if it is indoors and in a container. If you want to upgrade to the solar gen there is no way to upgrade it using a charged solar park - you have to remove all of its charge manually (took me the entire day to do this). Suggest that we can upgrade to solar gen using both charged and uncharged solar parks. Or allow us to clear a charged solar parks ourselves. 1. Potted plants don't advance to the next growth stage. You already know this but this might be useful to newcomers to HC mod. 2. Planting corn (on land) results in producing white corn and white corn seeds. You cannot plant white corn at all. 3. The requirements for building a wagon should be toned down. You need 36 oiled planks. one plank requires 100 corn (all types) seeds. Combined this with issue #2 and you'll take months if not years to make a wagon. Depends on your luck of getting corn seeds from mystery packets. Chances are 4/75 (all the different corn) from a mystery packet. Plus mystery packets are rare drops (zombies/containers) themselves. You can shuck 4 corn seeds from corn itself but good luck finding 900 corn in stores. 4. Repairing a weapon does not always repair it. It would increase the repair counter visually but the durability stays the same. 5. Might be a vanilla thing but how about increasing how much repair does? Wood glue repairs 50% but then it goes down to 25, 20, 13. Why not increase the % from using HC items? 6. Option to fully repair a weapon using a large number of resources. Perhaps double or triple the resources required to make that item. 7. Some items appear to be broken when you log back on. Eg. I saw plastic (broken) and electronic scraps (broken). Apparently some of these broken items can no longer be used in a recipe. This issue has been around for a long time. 8. I find steel pulleys all the time but I have never found an iron pulley. 9. How about when you grow corn there's a chance rabbits can appear in that crop (or nearby trap). 10. Split 'Gather flora' into different categories. Perhaps if you choose the flower book you only get flowers, fungi only mushroom and food. Trees = everything else? I sometimes only want to find materials but I get so much food/mushrooms from it that I spend even more time getting rid of unwanted items. 11. Make a special item/container for large animals like what you did for rabbits/chickens. What if I want to leave for a very long time? Better yet incorporate some ideas from the irrigation mod to auto-feed animals. Eg. Fill barrel full of food and have the system autofeed rabbit hutches every so often. 12. We know you like to incorporate other mods into your mods but please make sure that after you merge them, it works (potted plants is perfect example). Nothing wrong with asking the community to beta test for you (TIS does this *all* the time and they're the developer!). We know that you have spent a lot of time on your mod and you have done a great service to the PZ community. We really really appreciate it.